In his excellent book “Ballpark: Camden Yards and the Building of an American Dream”, author Peter Richmond briefly discusses the emotional passing of Baltimore’s Memorial Stadium. He sums up the attachment Orioles fans had to 33rd Street by saying “it was what happened on the field that made Memorial Stadium special”. I’ve seen this sentiment echoed in other places, and in remembrance of a great ballpark, I respectfully disagree. Without being critical of Richmond, he somewhat implies that Memorial Stadium wasn’t a great place to see a ballgame. And while his statement about the events on the field was true to an extent, as any O’s fan would acknowledge, it wasn’t the whole truth. A true Memorial Stadium tribute deservedly praises what was a great place for a night of baseball. To fully appreciate how great Memorial was, consider the period that it lived in. Are you SURE we’re going to a baseball game? The Orioles played on 33rd Street from 1954 through 1991. 30 miles south, the Washington Senators began playing in cavernous D.C. Stadium (now RFK) in 1962, and played there through 1971 before moving to Texas and becoming the Rangers. Meanwhile, about 90 miles north in Philadelphia, the Phillies moved into Veterans Stadium in 1971—another venue designed more for football than baseball. The multipurpose donuts that baseball fans sneered at for years were actually fairly popular when they first burst on the scene. With Busch in St. Louis, Three Rivers in Pittsburgh, Riverfront in Cincinnati, and many others, cities and teams went the route of football stadiums that could be tweaked for baseball, with easy to maintain carpeted fields and locations near an airport. Nowadays, ask most baseball fans what the worst venues are, and two names pop up frequently: Tropicana Field in Tampa Bay with its carpet and roof, and O.Co Coliseum in Oakland with its “Mount Davis” grandstand tactlessly tacked on for Raiders fans. During its tenure as home of the Florida Marlins, Sun Life Stadium usually ranked pretty high too. Memorial Stadium, on the other hand, seemed to be designed more as a venue for baseball than football. Fans would tell you it wasn’t great for football, even as it earned the nickname “The World’s Largest Outdoor Insane Asylum” during the Colts’ glory years. This became even more pronounced when the Colts moved out of town, and the Memorial Stadium baseball field was no longer stained by the yard lines of a lesser sport in Septembers. 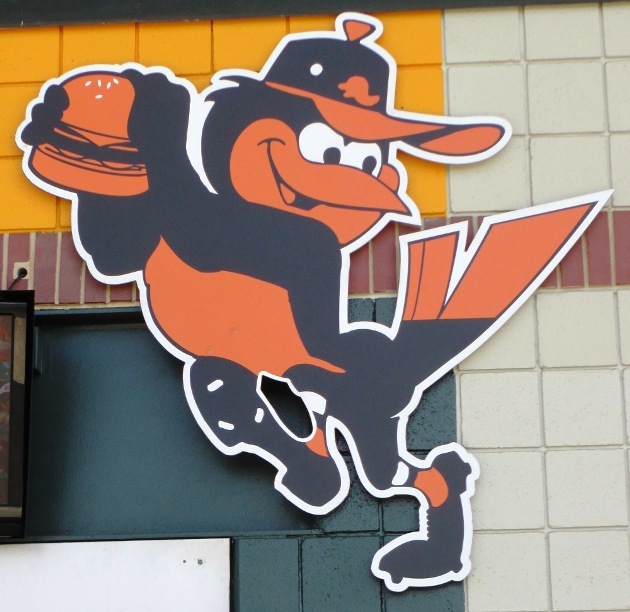 As a young baseball fan growing up in the Philadelphia area, the two-hour trip to Baltimore and an Orioles game was light years ahead of seeing a game at the concrete donut in Philly on the happiness meter. From top to bottom, everything seemed more special in Memorial. It was smaller and humbler. It had a much more attractive brick façade on the outside, with a stunning and poignant dedication to World War II soldiers that I never neglected to read as we waited in line to get in. It was in a residential neighborhood, which made parking difficult but was much easier to look at. The light towers stood majestically over the field, the first element of the ballpark to come into view after a seemingly endless ride on Loch Raven Boulevard. Sure, what happened there was baseball greatness. 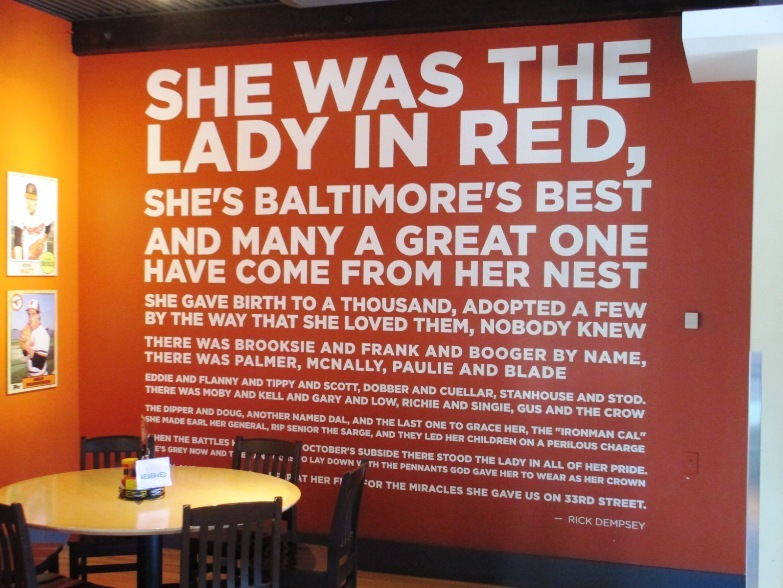 Part of what made being an Orioles fan special was a great team full of lovable characters. Of course Birds fans loved Brooks Robinson’s superhuman reflexes at third base, Jim Palmer’s perfectly graceful windup, and Earl Weaver’s manic fury with umpires. The team was full of unsung heroes too in my youth—like steady outfielder Al Bumbry, the classic platoon of Gary Roenicke and John Lowenstein, goaltender and team leader Rick Dempsey, and solid relief pitchers like Tippy Martinez and Don “Fullpack” Stanhouse (so nicknamed for the amount of cigarettes Weaver would smoke when he was on the mound). There was nothing like Orioles Magic and teams that won so frequently with late-inning heroics. 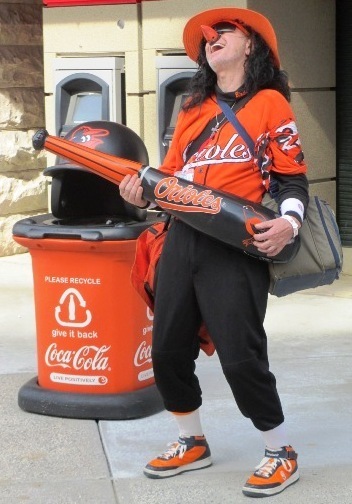 Being an Orioles fan was special, something you felt no other team’s fans had, not even Yankees fans. But all of that was a huge bonus. Memorial Stadium was distinguished as a venue too, and just as much so when the Orioles faltered in the 1980s. It sat on 33rd Street, not being flashy, not going along with all of the modern, economically friendly and equally sterile venues of the 70s and 80s that treated baseball as a secondary sport. Had it lasted as long as Tiger Stadium or Comiskey Park, it may have been just as revered. It was grass. It was open. It was bricks. It was all of the things teams eventually realized that they had forgotten in their concrete and plastic new homes. For a ballgame, few places were better than Memorial Stadium in its day. Of all of the stadiums back then, it was one of the few that actually didn’t need replacing, at least on baseball-friendliness grounds. When Oriole Park at Camden Yards opened in 1992, it was a spectacular triumph and instantly won over baseball fans everywhere. It is still today one of baseball’s best venues. But it had to be. Orioles fans my age remember the shoes it had to fill. Rick Dempsey’s poem dedicated to the pile of bricks on 33rd Street.